You could wander around Hong Kong’s art scene where galleries after galleries showcase popular works in the region or the world. But have you walked away from Hollywood Road, and search for alternative visuals that pleases the eye? Something that goes.. POW! We found a colorful one by Afterworkshop.hk on Sik On Street. Its easy to miss, but hard to pass off as just another street art. Colours scream at you, like a buffet spread for your eyes only. 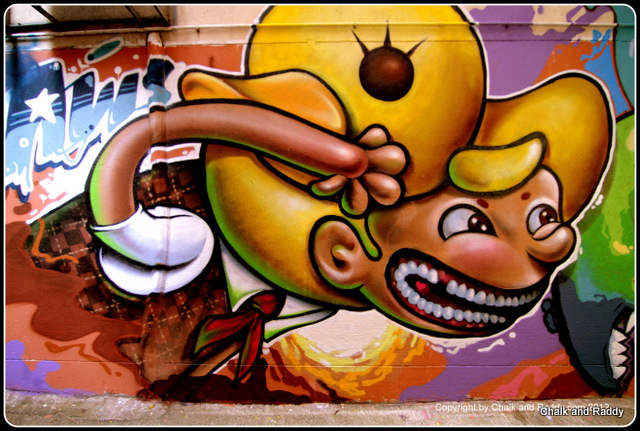 The characters are comical and edgy at the same time, and it leaves you with your own imagination of who and what is going on in that mural. 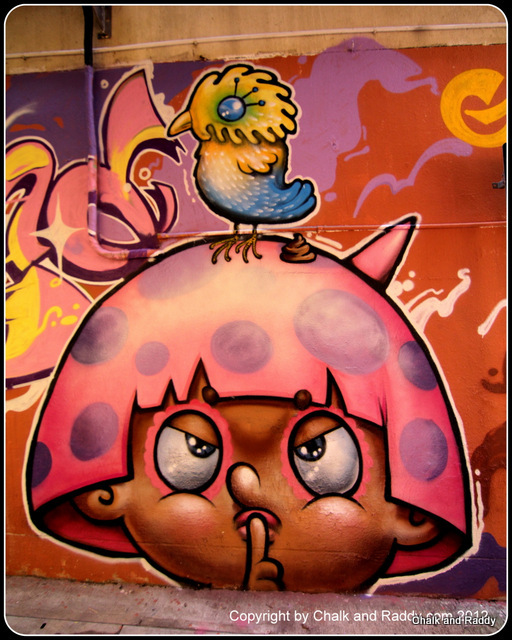 Afterworkshop is not just another street art collaboration – it is a movement of artists with full time jobs and street art is their after hours recreation. Not your typical hobby i would say, and may be disapproved by the general public – except that it is done very tastefully. No complaints there as it looks a million times better than the typical Hong Kong dark deserted alleys. 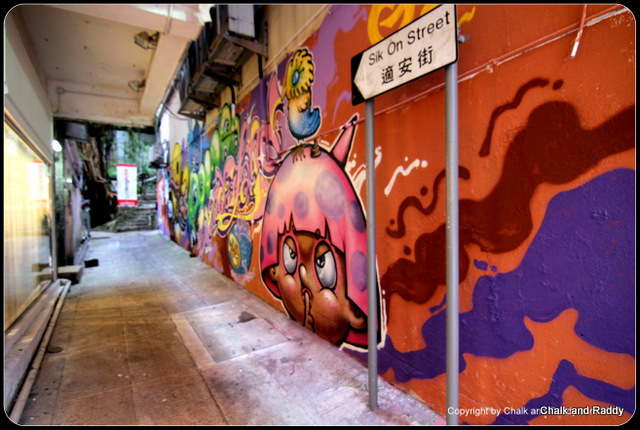 The group’s artists are well known, and there are workshops too if you decide to take it up in the hope of doing some public service to Hong Kong’s old buildings in need of a good makeover. We say, Afterworkshop.hk is Hong Kong’s answer to a more creative and interesting city. 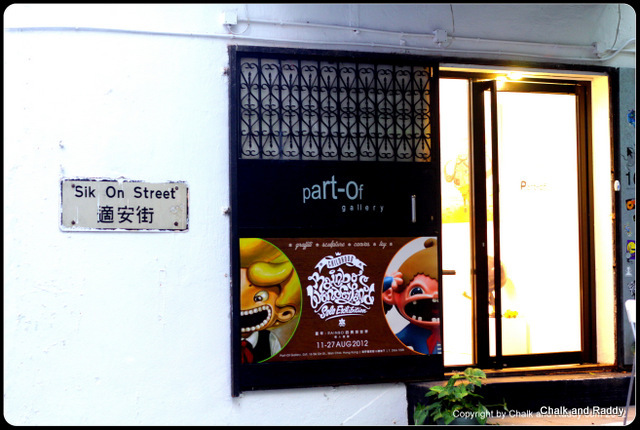 Oh yes, and in that alley we found Part-Of gallery, where Afterworkshop,hk’s member Rainbo was exhibiting. The series is about the artists’ reflection of her childhood, growing up in a village in Hunan, China. 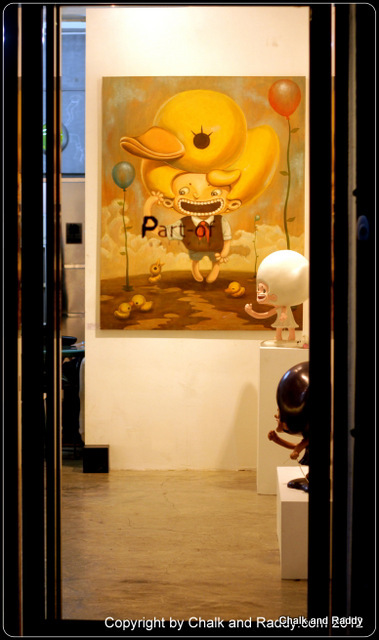 She brings back the naivety and innocence of a child through her oil painting works, toys and a few sculptures. 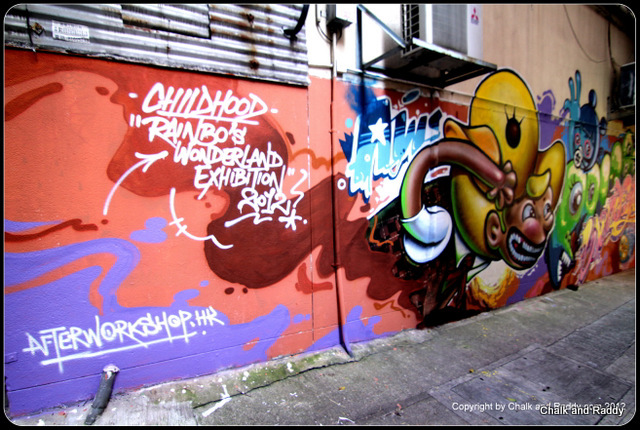 Posted on August 30, 2012 by ChalkandRaddyPosted in Visual ArtTagged Afterworkshop, Rainbo, Sik On Street, Street Art Hong Kong.